It’s not too early to get involved — plan or participate in an event in your community! 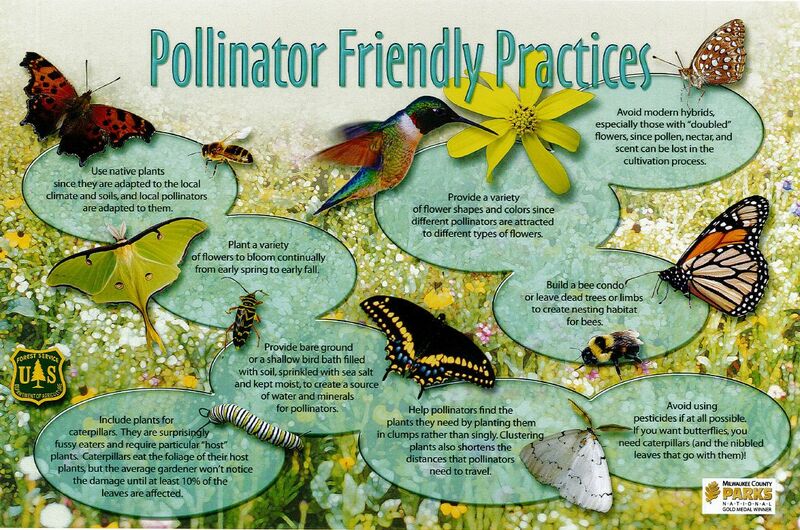 Join the Pollinator Partnership to promote protection of pollinators including bees, birds, butterflies and bats. Go to their website to add your event, get free pdfs and app, purchase materials and books, use the logos, and more! A few years ago The Wisconsin Gardener on PBS featured the work of Jan Wos, the gifted horticulturist and then owner of Mayflower Greenhouse in Green Bay. As I watched the program I was awestruck by his knowledge of plants as well as the creative way he used the unconventional as planters like suitcases, old dressers, and an assortment of repurposed items as containers. 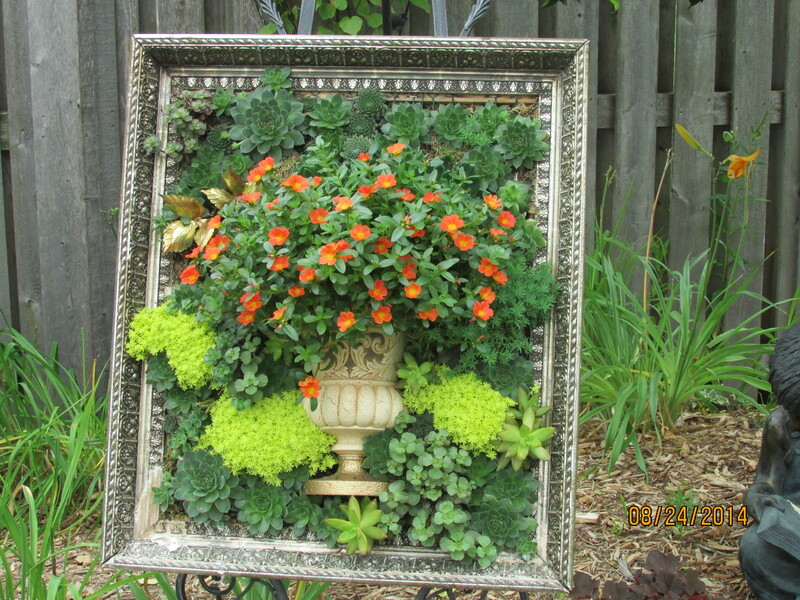 On this particular segment I especially admired his use of picture frames as planters. Time for a visit to Mayflower! Though Jan has since passed away, you can still see his ideas and influence there today. I think gardeners delight in finding the unusual and innovative idea that will add to the beauty of his or her garden. It was picture frames for me! It was also a creative answer to bringing together my yard sale shopping and gardening interests! While at the greenhouse, my hubby studied the construction of the planter box and took some snapshots and we were out to do it ourselves. Since that time I have become the greatest admirer of hen and chicks for their versatility and easy care in picture frame plantings. Different groundcovers like ajuga are also favorites as well as moss roses which add lovely blossoms and color. Adding a touch of former home wall décor like a gold metal leaf, butterfly, or flower adds a touch of whimsy too. 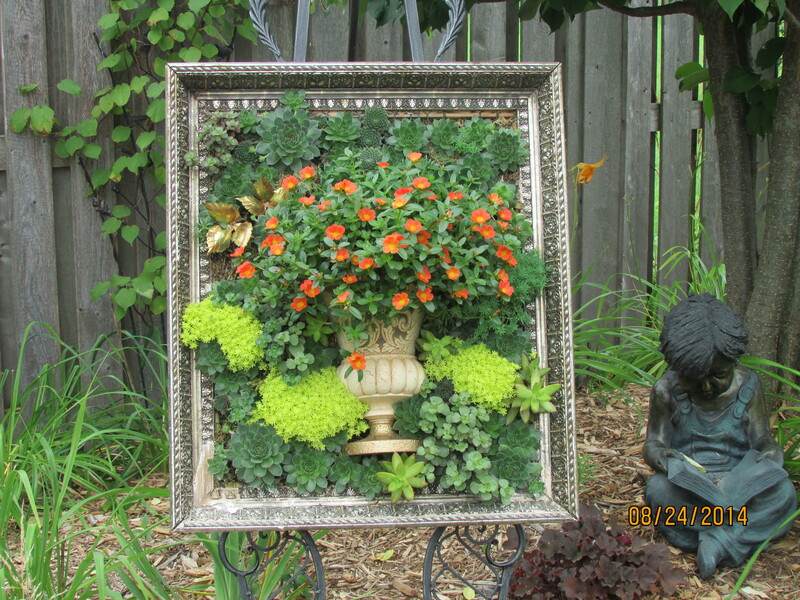 Every gardener can bring his or her own special touch to this artwork for a picture perfect garden spot! Plant Happy! On May 5, we posted a p hoto and article by OCMGA volunteer Rich Fischer about the native plants instruction being given to the 7th graders at Seton Catholic Middle School in Menasha. A large wooded area was being cleared of buckthorn and other invasive plants, to allow the kids to plant Wisconsin natives and make the area one of bea uty. On May 12, Rich was back in Jane’s Woods supervising the planting of trees, shrubs and herbaceous plants. As the plants mature, we’ll continue to monitor and post pictures to show the progress made by the hard work of all of the students. The Common Blue Violet (viola sororia) is the state flower of Wisconsin, Illinois, New Jersey, and Rhode Island. What do all of these states know? This little beauty of spring loves the climate of Wisconsin, especially shady and moist areas. 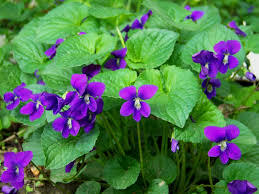 Let it spread throughout your shady areas and enjoy the beautiful little purple blooms each spring and summer. 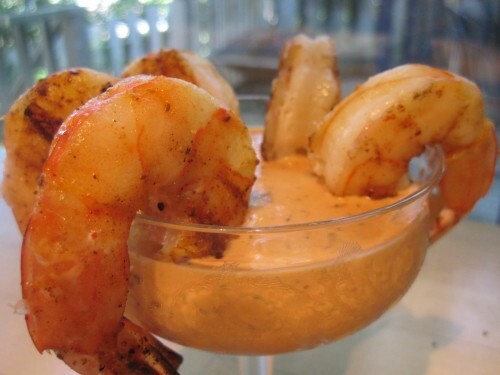 Comeback sauce is a dipping sauce for fried foods or as a salad dressing in the cuisine of central Mississippi.Similar to Louisiana remoulade, the base of the sauce consists of mayonnaise and chili sauce. From our own Mary Learman (our resident herb guru) comes this outstanding recipe for your summer entertaining. Makes about 1-½ cups. The original recipe was from a Jackson, Mississippi, restaurant. There are dozens of variations, including this one. Stir all the ingredients together. Cover and chill at least one hour before serving. The sauce can be stored in the refrigerator for one week. Makes a tasty dip, dressing or condiment for salads, vegetables and seafood. Memorial Day – not just a day off! How easy it is to lose sight of why we celebrate Memorial Day each year! Everyone is so busy with jobs and kids and aging parents and health issues, etc., etc., etc. To suddenly get a day off from work, then, is a celebration in and of itself. Still…doesn’t everyone have a father or uncle or brother or sister or grandparent that fought in some far distant place? And, while we may not know the details of that service, aren’t we grateful that they came home alive? What about those who didn’t, though — can we ever be thankful enough for the sacrifices made by those individuals and their families? The Memorial Day Foundation reminds us to take time on Monday, May 25, 2015 at 3:00 p.m. local time to observe a moment of silence in remembrance and appreciation for those who have served in our armed forces to protect our freedom. Seems like the least we can do! I was observing at my garden this spring, contemplating which plants would need to be moved and what new flowers I would add to replace those that didn’t survive the winter. Normally I think about color, height, and flowering season; however flower shapes also are an important element in garden design. Here’s a list of eight flower shapes and what you can expect them to do for your garden. Daises are the shape to choose for a simple, natural look. Flatheads horizontal shape gives the eye a place to rest and has a down to earth feel. Clusters provide some weight to a design. Loose clusters like phlox make good transitions between different shapes because of their indistinct form. Spikes are great attention getters that add height. Plumes bring a playful mood with fuzzy flowers and make a good transition between spikes and flatheads. Globes unusual shape stands out making them great accents or focal points. Trumpets and Cups are similar in shape but different in effect. Trumpets are attention getting while cups are simpler and more casual. Fillers provide a good looking backdrop to fill in bare spots. Planning a lot of differ shapes, will keep your eye moving throughout the entire garden, making it more interesting to look at. On the other hand, too much contrast can create a confusing jumble. Remedy the situation by repeating a shape to provide a sense of unity. Even a wild color combo like pink and orange, can be unified if you keep your flower shapes simple such as hot pink zinnias with flame orange sunflowers. To keep a monochromatic garden from becoming bland, use a variety of shapes like white hydrangea, lilies and delphinium. If you want to spotlight a favorite lily, plant it with filler, like baby’s breath which isn’t such an eye catching shape. Finally don’t forget, flowers change with the seasons, so take advantage of the shapes of seed heads and blooms, like coneflowers, that dry out on the stem to add year-round interest to your garden.